I finally managed to get a game down in Battle Bunker today, hooray! My opponent used Tau, and I ended up trying out my new Cult Mechanicus army. I didn't want to be That Guy and use my Imperial Knights, not when my opponent's army is filled with nothing but Fire Warriors and not much anti-vehicle stuff like fusion blasters and whatnot. It was a 1,000-point game so I wouldn't have enough points to fit an Imperial Knight in anyway. 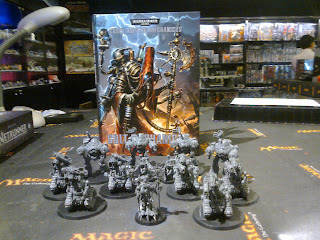 Nonetheless, I was more eager to test out my Cult Mechanicus army than my Imperial Knights, who have already lost 2 games so far. One where 3 of my Knights got glanced to death by 4 flying Hive Tyrants, and another disastrous game where my opponent sent several drop pods of Space Wolves down and basically ripped my Cohort Cybernetica-Imperial Knight-Imperial Guard army to shreds by tabling me in his second turn. I didn't even get my second turn. What the hell. Anyway, I decided to play against a friendlier opponent this time, someone who uses Tau instead of those damned Space Marines and their uber drop pods, and it was a much better game. We played all the way for 5 turns before I rolled a 2 and the game ended then. It was a kill-point game with no objectives, so the victory conditions were basically kill as many as you can. I think. That's how kill-point games work, right? 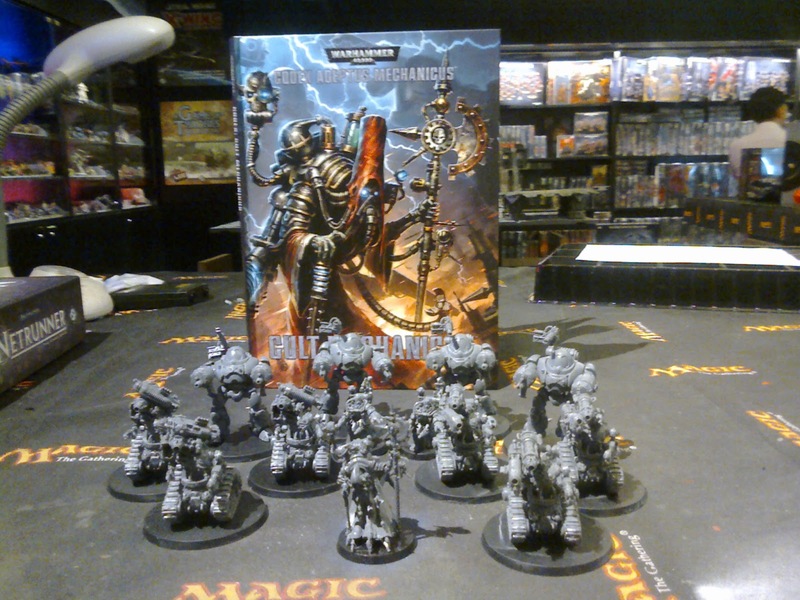 Cult Mechanicus army! For the Omnisiah! Commander in Crisis Suit with plasma rifle and burst cannon. Bodyguard with fusion blaster and something. 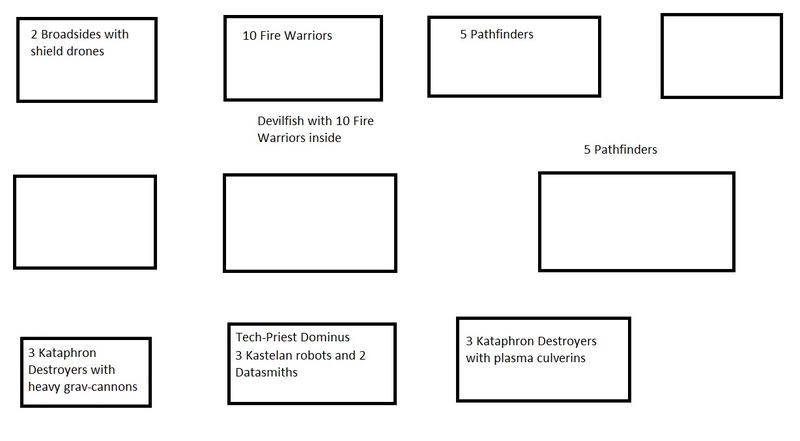 1 Devilfish, a dedicated transport for 1 team of Fire Warriors. Equipped with gun drones. 2 XV-8 Crisis Suits. Plasma rifles, fusion blasters. 1 missile pod. I think. They have 2 gun drones or something. 3 Stealth suits. 2 with burst cannons, 1 with fusion blaster. 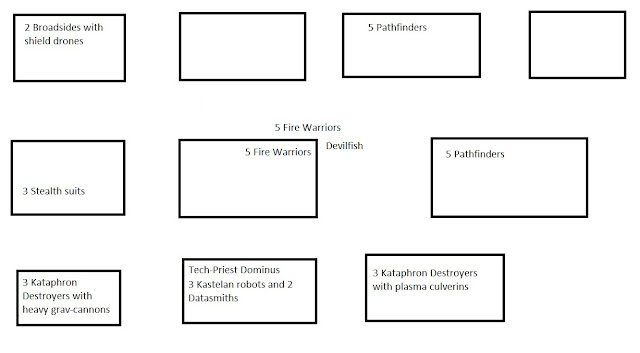 2 teams of 5 Pathfinders. One team has recon drone. Markerlights galore! 2 Broadsides, both with heavy rail rifles, 2 shield drones. I think they're 2 teams, but I don't know. I counted them as in the same team. I was supposed to start first, but my opponent seized the initiative by rolling a 6. Freaking hell, why do my opponents always seize the initiative on me? I got my initiative seized by my opponent in the last game, the Space Wolves dude who basically destroyed me in just 2 turns - I only got to play a single turn that game! Ouch. Anyway, he began first. Both of us started with all our armies hidden in ruins for cover. I deployed first (my opponent seized the initiative after all), by placing one team of 3 Kataphron destroyers, the ones with the heavy grav-cannons, in my left-most corner, inside ruins, on the 2nd floor. In the center ruins, I placed my Tech-Priest Dominus and Kastelan Robot Maniple of 3 with their 2 Cybernetica Datasmiths inside with him on the first floor. To their right was the 3 Kataphron Destroyers with plasma culverins. That's it. That's my army. My opponent placed his 2 Broadsides in his right-most corner, inside the ruins directly opposite my Kataphron destroyers with their heavy grav-cannons (they couldn't reach him anyway). In the center ruins was his team of 10 Fire Warrios, and in front of those ruins was his Devilfish, with another 10 Fire Warriors embarked inside them. 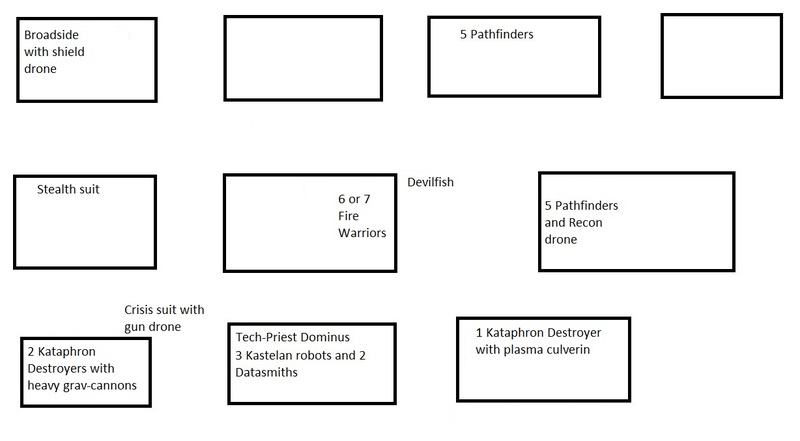 On his left was another team of Pathfinders, and further left was his 2nd team of Pathfinders with the recon drone. He placed his Crisis Suits in deep strike reserve and his Stealth team on infiltrate, so they didn't come in yet. I should draw a rough picture. My opponent basically moved his Devilfish forward, to the ruins in the middle, directly right in front of my Tech-Priest Dominus, but he didn't disembark his troops. I think. He infiltrated his Stealth team into the ruin right in front of my Kataphron Destroyers with heavy grav-cannons, but other than that I don't think he did anything. The Stealth suits couldn't see me because they hid behind a wall of that ruin, so they didn't fire. First, his Pathfinders fired. 5 shots, only 1 hit. So 1 markerlight on my plasma Kataphron Destroyers, which didn't do him a lot of good. He also realized that his Fire Warriors were out of range, so he didn't fire. Instead, he had his Broadsides fire at my grav Kataphron Destroyers. Twin-linked, so he got to re-roll his hits. I think he made about 2 hits, and 2 wounds (strength 8 AP 1 weapons, ouch!) against my toughness 5 Destroyers, but I made my cover saves and none of them took any wounds. Yay. Phew. My turn. I moved my Kataphron Destroyers downstairs because I only rolled a 3 for movement. Ouch. So they only ended up moving downstairs. Turns out this is the only movement I made the entire game because well, I didn't need to move them, and most of my opponents' units were within my range anyway. 30" heavy grav-cannons with salvo? Yay. 24" palsma culverins with 2 blasts each? Yay. 36" heavy phosphor blasters with 3 shots each? Awesome. I stupidly forgot to use a Canticle of the Omnissiah here. Very stupid of me. As a result, I rolled 2 ones when testing for gets hot! and I had 2 wounds on my plasma Kataphron Destroyers when I fired at the Devilfish just beyond me. To make matters worse, out of the 4 small blasts that succeeded in not getting hot, only 2 hit. The other 2 scattered way off. I ended up not being able to even glance the damned Devilfish. Lesson learned. 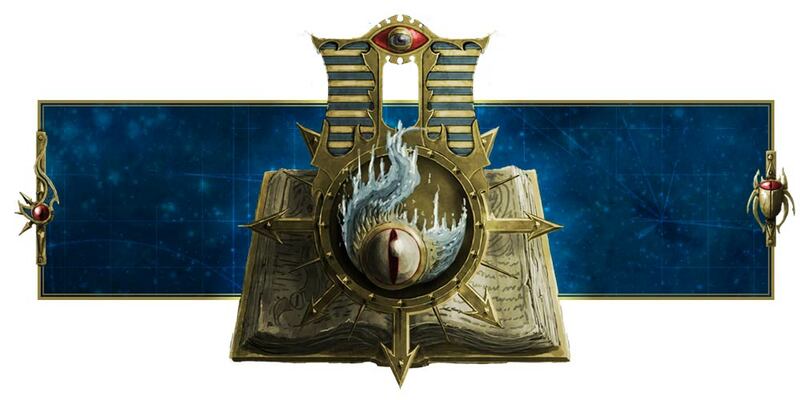 Use the damned Canticles of the Omnissiah next time! Needless to say, my grav Destroyers couldn't hit anything. The Broadsides were just out of range, which was why I moved them (only to have them descend to the first floor instead! ), and I couldn't see the Stealth suits. Oh well. My Kastelan robots were beast. They fired their heavy phosphor blasts at the Fire Warriors right opposite them, and boom! 9 twin-linked shots, 9 normal shots, and I hit quite a few. I think I wounded all of them, maybe about 11 or so. However, my opponent made all his cover saves and only ended up losing 3 of his Fire Warriors. Here's the hilarious thing, though. Having lost 30% of his forces, he had to take a morale check....and he failed the morale check. Even worse, he rolled an 8 when falling back, meaning the 7 surviving Fire Warriors ran off the edge of his table. In other words, they're dead. First blood to me! Now the battlefield should look something like this. My opponent basically tried to deep strike his Crisis suits, but he failed both teams, so neither of them came on. Oh well. All I can say is, bad luck. He moved his Devilfish up, to the side of the ruins, and disembarked his troops, so his troops had a +1 t their cover save thanks to intervening models. He moved his 2nd team of Pathfinders, the one with the Recon drone (whoops! I forgot to include it in the diagram, I'll include it next time), into the ruins in front of them. But they couldn't see any of my units, and ditto for me. Then he moved his Stealth suits into the 2nd story so that the wall is no longer blocking their line of sight. This then leads to his shooting phase! I think he fired markerlights into my Kataphron Destroyers with heavy grav-cannons if I remember correctly. Unfortunately, he only scored one markerlight hit, so he could only increase his ballistic skill for the units to increase their rate of fire. Bad for me, except that he was unable to remove my cover save! I have cover save! Woohoo! Anyway, his 3 Stealth units unloaded their burst cannons into me, but as I was toughness 5, they didn't hurt me...I think. He must have really bad rolls. He did hit me with a fusion blaster, but I saved that one. Phew. Unfortunately, he scored all his hits with his Broadsides, and I think had up to 3 or 4 wounds. I failed to save 1 wound, so one of my Kataphron Destroyers carried a wound. Oh well. Other than that...he didn't fire anything because my units were still in cover and out of range. Over to me. Yay. My turn. This time I remembered to use the damned Canticles of the Omnissiah. So I used Benediction of Omniscience. As I have 4 units, I could re-roll ones and twos that I missed. Yay. Stupidly enough, this time I didn't get any get hot rolls. What the hell. I aimed for the Devilfish again, and I managed to score a couple of hits! YES! I landed a penetrating hit on the Devilfish, taking off a hull point and leaving the crew stunned (I rolled a one on the vehicle damage chart), and wiped out about 2 or 3 Fire Warriors. I think only 2, because they largely made their cover saves, and I don't remember him taking a morale check for that. My grav Kataphron Destroyers unloaded everything they had on the Stealth suits - they had to, those buggers had Shroud and stuff. 6 Salvo shots because they were right on my doorstep, well, not really, but within 15", so that made 18 shots. I think I scored about 9 to 11 hits, and all wounded. My opponent made his cover saves and had a couple of ones so two of the Stealth suits died. YES! Morale check, and the last surviving guy failed, so he ran all the way back into the other side of the ruin. Take that, sucker! Funnily enough, he survived for the entire game. My Kastelan robots fired everything they had on the Broadside and shield drone. The shield drone crumbled under the weight of 18 shots (about 14 hits, I think, I could re-roll them, remember?) AP 3 meant they weren't that good against the Broadside, but my opponent was so unlucky with his rolls he rolled a couple of ones. The Broadside died thanks to that unlucky roll. Ouch. Just ouch. I mean, the damned guy had 2+ armor save and 2 wounds, but my opponent rolled 2 ones?! Horrible luck, my friend. That was absolutely horrible luck. I felt sorry for him. Things seemed to be looking up for me until my opponent succeeded in deep striking his Crisis suits. Right behind and in front of me too. Oh boy. Oh boy. Yup. His 2 Crisis suits scattered a bit, so they ended up in front of my gav Destroyers. His Stealth suit failed to consolidate and continued running back. He moved his Fire Warriors up onto the second floor. His Pathfinders continued to move, and I think some of them moved up to the second story where I can see them. The Stealth suit continued to fail his morale check, so he actually moved out of the ruins and wandered in between. Ha ha. Poor guy. This is where I got hit, hard. His Pathfinders blasted my plasma Kataphron Destroyers with markerlights, and basically had a lot on them to remove cover and basically increase ballistic skill on them. Argh. The second team did the same to my grav Kataphron Destroyers, so they also lost their cover. Argh. The Crisis Commander and his bodyguard killed 2 of my plasma Destroyers and left 1 wound on my last one. I took a morale check, and for some reason he passed and stayed where he was. Phew. The Crisis suits blasted my grav Destroyers with plasma rifles and stuff, and I think the Broadside joined in, and between them they killed one Destroyer and left a 2nd with 1 wound on him. Ouch. Again, they passed their morale check. These guys surprisingly have high leadership score, an 8. Then again, I was rolling 4s (a 1and a 3) and 5s, so I was also lucky. Anyway, the Crisis suits had hit and run, so the 2 Crisis suits moved to the side of my ruin, the right of my Destroyers instead of the front. The Commander and bodyguard rolled a pathetic 3 or 4 so they actually didn't move a lot, just more to the right and still right next to my Kastelan robots. Ha ha. Termination time. Running away? I won't let you. Next was my turn and I was ready for revenge. Again I used Benediction of the Omnissiah, and I was lucky. I rolled 2 ones with my gets hot! so I got to re-roll them and kill another 1 or 2 Fire Warriors with my last surviving plasma Destroyer. Or maybe I didn't kill any. I can't remember. My 2 surviving grav Destroyers unloaded their heavy grav-cannons on the gun drone and Crisis Suit next to them. The gun drone died first, and then the Crisis Suit also died under the weight of 12 shots. Muahahaha. My Datasmiths fired their gamma pistols on the bodyguard first and scored 2 hits and 2 wounds. Unfortunately, my opponent saved one of those wounds as he was under cover, leaving one wound. I then unloaded all the heavy phosphor blasters into the Crisis bodyguard and Commander, and basically killed the bodyguard and scored about 1 wound on the Commander. Thanks to luminagen, I reduced the cover save by a bit, but it mattered little as my macrostubber didn't wound him or something. Next was my Volkite blaster, which dealt 3 wounds, but he saved 1 of them. The Commander had 4 wounds, so my opponent thought he survived...but alas! Volkite blaster has the Deflagrate rule, so I caused another 2 wounds, and I think he failed one of them...so his Commander died. I have Slay the Warlord! Woohoo! I did it! I got rid of the Crisis Commander! So after all that, the battlefield now looks like this. The Stealth Suit finally passed his leadership test and stopped running away. Consolidating, he jumped back inside the ruin, though right at the back. 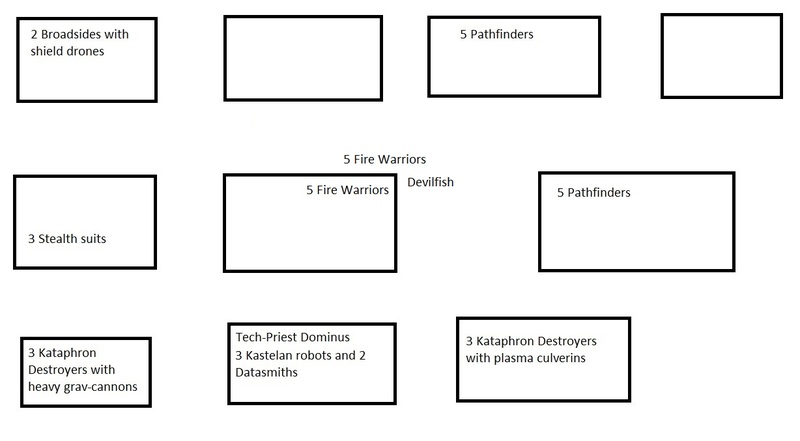 The 6 and 7 Fire Warriors continued to move forward until all are upon the ledge, and the 5 Pathfinders with recon drone also moved up so that all 6 models are on the 2nd story ledge. I'm not sure what my opponent did, but I think he threw markerlights on my Kastelan robots and the 2 Kataphron Destroyers with heavy grav-cannons. He used the Ignore Cover function and proceeded to fire away with his Devilfish and Fire Warriors. But with the Strength 5 pulse rifles from the Fire Warriors and gun drones and the toughness 7 of my Kastelan robots....he failed to wound any of them. He needed to roll a 6 to wound the toughness 7 Kastelan robots, and he didn't roll any sixes at all. Oh well. All the better for me. His Crisis suit and Broadside combined to take down a 2nd grav Destroyer and left the last one with a wound. This was when I thought his leadership was 7, and I rolled an 8. Thankfully, my opponent reminded me that leadership was 8 and I checked, so the last grav Destroyer actually passed his leadership test and stayed where he was. Woohoo. Great. My turn. As I had already used the Benediction of Omniscience twice, I had to switch the canticle now. So I went with Shroudpsalm to increase my cover saves to 2. Not that they would work, considering the damned Pathfinders and their markerlights would give them ignore cover anyway! Ouch. I had only 2 plasma shots so I rolled them first, and fortunately I didn't roll any ones. Unfortunately, both small blasts scattered pretty far and didn't hit the Pathfinders and recon drone that I was aiming. They live! ARGH! I'll get them next time. My surviving Kataphron Destroyer unloaded his heavy grav-cannon into the remaining Crisis suit, and somehow I managed to kill them both with the 6 shots (I think I only hit about 4 of them?) and scoring 4 wounds. Phew. No cover saves or armor saves for them, I think that's why they died so easily. They were out in the open, after all. I had my Datasmiths fire their gamma pistols on the Devilfish, but I rolled poorly for one armorbane roll. The 2nd one was much better and I scored a penetrating hit. Not much, another crew shaken result. I spent the heavy phosphor blasts all on glancing the Devilfish to death and had 3 glancing hits, but as the guy already had 2 hull points taken, it was overkill and the Devilfish was destroyed. Not bad, eh? I think the only movement was the Stealth suit, which came up to the front of the ruins. The Pathfinders fired their markerlights on my Kastelan robots again, and the Fire Warriors' measly pulse rifles did nothing to my toughness 7 Kastelan robots. It was difficult for him to roll sixes, I guess. On the other side, the Broadside fired his heavy rail rifle, having benefited from a single markerlight, and hit twice, wounding both times. Fortunately, thanks to Shroudpsalm, I rolled and passed my cover saves. Yay. My surviving Kataphron Destroyer lived. That's the extent to what my opponent could do, what with so little attacking forces left. I can't remember why he didn't fire with his Stealth suit. Maybe I saved that one too, or he missed. I can't remember. Anyway, I fired two plasma shots at the Pathfinders again, and this time in addition to not getting hot, I hit the target twice! Without scattering! I dealt about six wounds, and I think my opponent wasn't able to save three of them, so three Pathfinders went puff and disintegrated under superheated plasma blasts. Ha ha. I think he took a morale check and they passed, so good on them. My last grav Destroyer fired on the Stealth suit, but only 2 shots hit, and only 1 wounded. BUT my opponent rolled his cover save and got it. Hey. I completely forgot that they have Cognis flamers. Whoops. Oh well, whatever. I think they can only fire one weapon, somebody correct me if I'm wrong, so I can't fire anyway. Only my monstrous creatures Kastelan robots can fire 2 weapons at once, and my Tech-Priest Dominus with his special rules (awesome Mechadendrite Harness! ), so I doubt the Destroyers can. Anyway, the Stealth suit lived. Good on him. My Kastelan robots fired their heavy phosphor blasters on the Fire Warriors and took out maybe 5 of them, or 6. I can't remember. There were about 2 or 3 left, and I finished them off with the Volkite blaster of awesomeness. I think I hit 2, and wounded 2, and he was unable to make the saves for 1 or 2, so the 2 wounds or 4 wounds (I can't remember) killed off the surviving Fire Warriors. YES! All Fire Warriors have been extinguished! It was then I ended my turn and rolled the dice to see if the game would continue. I rolled a 2, which meant the game ended. I won the game, with about 7 kill points in my favor, and my opponent almost getting 2 (but 0 because I still had one Kataphron Destroyer each!). 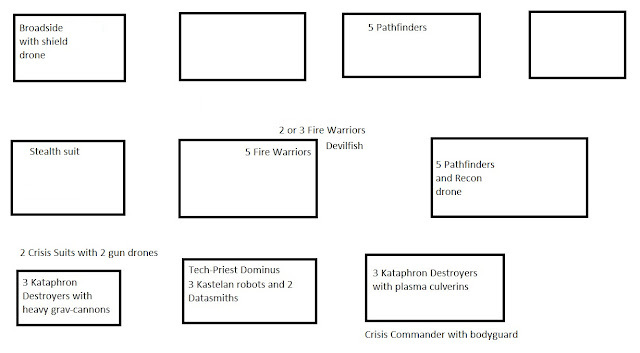 Let's see...I killed 1 team of Fire Warriors, then a Commander and his bodyguard, then 2 Crisis suits, then a Devilfish, and finally a 2nd team of Fire Warriors. So that's 5 kill points. I have First Blood and Slay the Warlord, another 2 kill points, so that makes it 7. My first victory ever, and a much closer game than the kill points actually show. I mean, I have only 4 units, so my opponent had a good chance of wiping me out if he had the chance. Actually, he would have mopped the floor with me had he used Riptides and more Broadsides instead of relying on Fire Warriors. I don't know, actually. I really don't know. Anyway, it was a great game, and I really enjoyed it. It seems that the Cult Mechanicus army isn't bad after all, much better than my Imperial Knights at least (surprising enough!). It's not unbeatable, I mean I almost lost 2 squads of Kataphron Destroyers, and probably would have if my cover saves were terrible, or if my opponent wasn't unlucky enough to fail his damned armor saves, like for his poor Broadside. And I was lucky because he didn't roll any sixes to wound my Kastelan robots. Except that I have 3+ armor saves, Feel No Pain, It Will Not Die on my entire unit. Muahahaha. So he probably wouldn't have landed a wound anyway. A much better game than the last one where I got tabled in 2 turns (my opponent's 2nd turn, I didn't even get my 2nd turn! ), thanks to spamming plasma and basically destroying my Kastelan robots. Funny enough, I forgot to roll Feel No Pain for that particular game, sigh. Oh well. I'll start building my Skitarii army tomorrow. 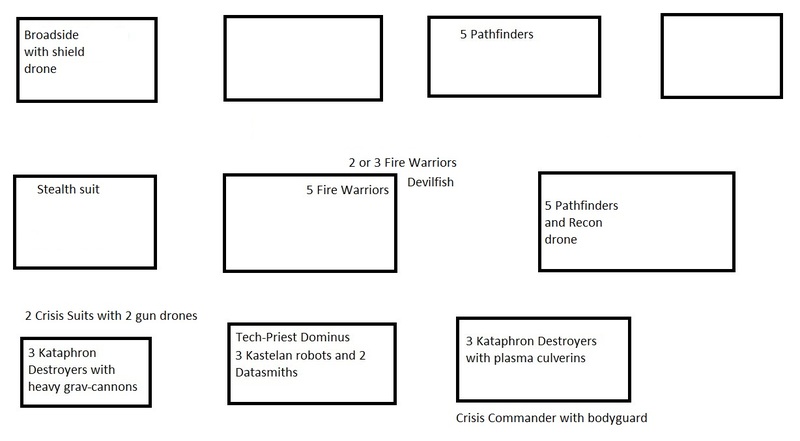 I probably will go with 3 Onager Dunecrawlers for now because I want the Field Harmonics my Emanatus force field and throwing 3 Strength 10 AP 1 small blasts with Concussive and BS4 (or more if I increased my BS with the Skitarii doctrina) is very tempting. The downside is that I'll be stuck with only one Ironstrider Ballistarii, but hey, 4++ invulnerable safe, front and side armor 12, Strength 10 AP 1 blast attacks with the option to switch to Icarus Array (I'll use magnets or blu-tac) sounds much more tempting. We'll see. For the Emperor! I mean the Omnissiah. I'm planning for at least 2 other battle reports in the near future. 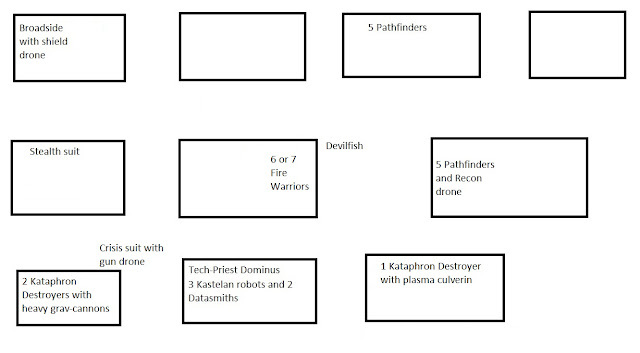 Probably one featuring my Skitarii Battle Maniple (1 unit of everything except Dragoons because I chose the Ironstrider instead), and one with my Adeptus Mechanicus War Convocation, so stay tuned!